PRIMUS is offering "STERILE LATEX GAUNTLETS" for extra protection. These gloves are made up of natural rubber latex and come in lengths ranging from 450 mm to 500 mm. These are available in both Anatomic as well as ambidextrous form, Powdered and Powder Free. Polymer coated version of this product is also available. 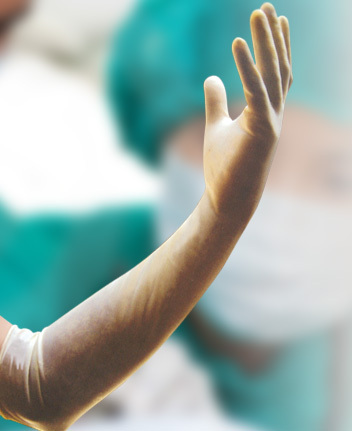 Latex Gauntlets are used in areas like Maternity, Gynecology/Obstetric, Neurosurgery, Oncology, Old age Homes etc. where increased level of protection is needed and in the pharmaceutical industry, this is used for handling formulations, tablets etc. These gloves are thicker than normal surgical gloves providing greater resistance to tears, punctures at the same time retaining flexibility and sensitivity. The gloves are sterilized either bu EO (Ethylene Oxide Gas) or by Gamma Radiation as per customer requirement. Packaging is based on specifications requested by the customer. NON sterile version of this product, packed in dispenser boxes is also available. Manufactured from High quality Natural rubber latex. In-process control covering all aspects of manufacturing ensure a consistent high quality. In-line leaching process reduce content of soluble proteins. Avoidance of thiurams for lower allergenic potential. Good elongation provide little and fatigue and lasting comfort in use even during long procedures. Beaded cuff for secure fit. Lightly powdered with USP grade absorbable corn starch. Powder FREE Gloves Manufactured on sophisticated automatic chlorinator machines for consistent quality. Medical/ Hospital Use (in long surgical procedures like Gynecology, Obstetric, Neuro Surgery, etc) Old Age Homes. Sterile versions available are packed in Plastic Pouches also. NON Sterile versions are also available packed in Plastic Sleeves or Paper Wallets.